PreS-Gr 1–Making mistakes is difficult, but maybe it's the best way to learn. Readers can tell from the first page that Penelope, a T-rex, is going to learn a lot at her school, where she is the only dinosaur and the other students are human. Then, "…she ate them. Because children are delicious." Mrs Noodleman insists that she "spit them out at once!" The days pass, and Penelope really tries, but the children are afraid of her. "Mrs. Noodleman, Penelope ate William Omoto again!,'" a classmate calls out. Walter the goldfish, the class pet, is not afraid, and he gives the little T-rex some of her own medicine—a chomp on the finger. "Once Penelope found out what it was like to be someone's snack, she lost her appetite for children." The narrative is simple, straightforward, and hysterical. Higgins's illustrations in graphite, ink, and Photoshop are bold and cartoonish with plenty of silly touches—a single sneaker hanging by its lace from Penelope's mouth, the slime-covered classmates that Penelope spits out at her teacher's command, the T-rex at the bottom of the slide with her mouth a wide-open cave for the next comer will all garner a laugh. 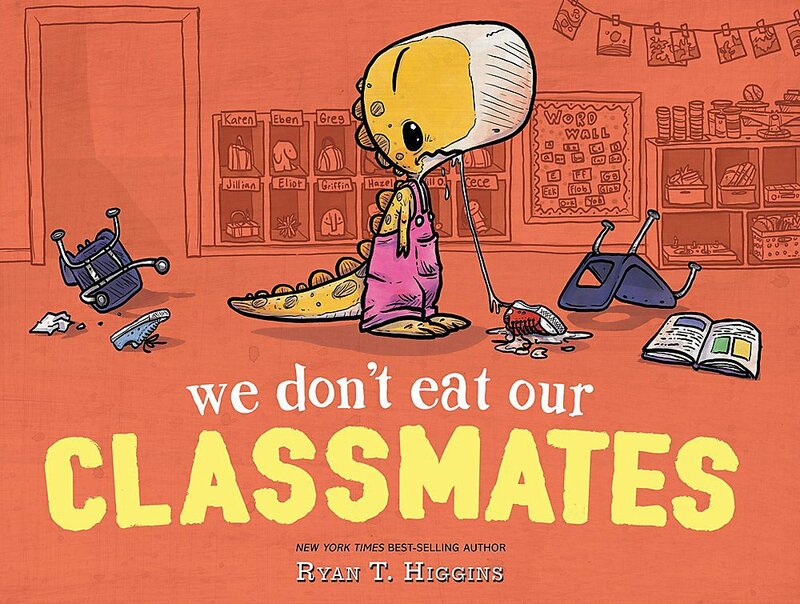 VERDICT For the times when students struggle to understand one another and when impulse control needs a little strengthening, pair this winner with Mo Willems's Edwina, the Dinosaur Who Didn't Know She Was Extinct. An appealing read-aloud selection.